Asphalt shingles are the primary choice of homeowners for their roofs in the United States. The key value that asphalt shingles provide is the water shedding ability to protect the home and overall aesthetic appearance. One of the most important components of the shingle is the asphalt coating. The asphalt coating is typically a highly filled oxidized coating that meets the requirements of ASTM D 3462. There are other requirements for the coating that vary from one manufacturer to the next, but they all need the asphalt coating to perform in the plant and in the finished product. There is a logical path to integrating rheology into asphalt coatings, in a similar matter to the way performance-based specifications for paving asphalt have evolved. The difficulty when working with asphalt coating is that the refinery produces flux that then is oxidized by either the shingle manufacturer or a third party. The asphalt coating properties are what drive the requirements and there is limited agreement in the industry to what the rheological requirements would be beyond empirical softening point, penetration and the asphalt viscosity. We attempt to integrate rheology into the asphalt coating evaluation in this article. The other components of a shingle – filler, granules and mat – most often come from regional sources and can differ widely. Other factors that influence the shingle forms from various manufacturers include the types of products they market, processing conditions and the specific performance desired based on the shingle warranty. With these subtle differences, each manufacturing plant will require an asphalt coating that may need to be subtly different – i.e. more aggressive and stickier to glue the dry components together or less aggressive and firmer so that the individual shingles don’t stick together – to achieve the desired level of performance. Add all those differences in incoming raw materials, shingle form, processing conditions and desired level of performance with the regional differences of raw material asphalt supply, and it is easy to understand the different asphalt coating specifications that each individual plant needs to follow to make a consistent, performing, quality shingle. Traditionally, asphalt coatings have been characterized using empirical data that help the coating manufacturer provide a product that meets the properties desired by the shingle manufacturer. These measures have served the industry well over time, but they do not necessarily predict the performance of the shingle. These historical properties include softening point (ASTM D36), penetration @77°F (ASTM D5), viscosity @400F (ASTM D4402) and COC flash (ASTM D92). Other properties have also been specified, including stain and durability, which are more in line with performance. Staining potential is a key measure of how visually the shingle may perform. Durability is often characterized by weathering (ASTM D4798) to assess how long a coating may perform on a roof. A performance-based set of tests is desirable to the shingle manufacturer that describes more closely the fitness for use criteria they may have. This is where rheology will play a bigger part in the future. Rheologic tests provide the asphalt coating manufacturer a guideline of the properties desired and relate sticking in the bundle, granule adhesion and tear strengths to actual shingle performance. Each shingle manufacturer will eventually set its specifications according to these or other related FFU (fitness for use) requirements. Where do we start with rheology? The SHRP (Strategic Highway Research Program) was a program funded by the U.S. government to address research needs for better performance of the nation’s highway system. The asphalt program was a significant part of the overall program intended to better understand and characterize asphalt materials and their ultimate performance in service in a pavement structure. As part of that research, the asphalt paving industry did very extensive rheologic testing to characterize and grade different asphalts. This program was very successful in developing performance-graded asphalt binder specifications that all paving suppliers follow today. The roofing industry has looked at the results of SHRP and recognized some very good science that could be used for roof shingle binders. Because roof shingle binders are much stiffer than paving binders, rheologic testing parameters will have to be changed to reflect the material differences. But many similar techniques should be able to be used. To date, the RTAC (Roofing Technical Asphalt Committee) in the Asphalt Institute has started to investigate a variety of roofing binders using rheologic testing. With help from both the Asphalt Institute (AI) and Paragon Technical Services laboratories, and with roof coating binders supplied by Asphalt Institute member companies, some initial testing has occurred. The goal in this testing has been to find appropriate testing protocols that can characterize the coating binders and relate those rheological tests to traditional tests, such as softening point and penetration, which are meaningful to the shingle performance. An additional goal has been to unite asphalt coating manufacturers around the establishment of a consistent test protocol that can easily be performed. The AI and Paragon labs have tested a variety of asphalt coating samples and created rheologic data that can be related to the historical parameters of softening point and penetration. as the penetration test (25°C). The relationship, shown in Figure 1, reasonably matched the Gershkoff relationship but with a slightly different regression equation and a lower coefficient of determination (R2 value). Although the reason for the poorer correlation is not completely clear, it seems likely that at least part of the reason could be that the AI-Paragon data represents a smaller subset of the range of the Gershkoff data. Since coating asphalt binders were tested in the study, the penetration range was much smaller (8-21 dmm) compared to the Gershkoff study (10-200 dmm) that used paving grade asphalt binders. Technologists can determine the value of G*2.5 at 25°C by using the DSR and generally following ASTM D7175, “Standard Test Method for Determining the Complex Shear Modulus (G*) of Bituminous Mixtures Using Dynamic Shear Rheometer.” Testing should be conducted at a frequency of 2.5 rad/s using 8-mm parallel plate geometry and an applied shear strain of 1 percent. Except for the loading frequency, these operating parameters are comparable to the testing conditions used for paving asphalt binders after simulated long-term aging using the Pressure Aging Vessel (PAV). In a study reported on by Molenaar in 2004, it was suggested that dynamic viscosity, η*, could be related to softening point. 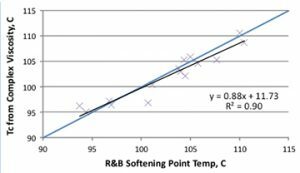 The relationship found by Molenaar suggested that the temperature at which η* was equal to 1200 Pa-s, when measured at 1 rad/s using the DSR, was related to the Ring & Ball (R&B) softening point temperature. To confirm this relationship, Paragon conducted testing on a variety of coating asphalt binders and compared the data from rheologic testing and traditional testing. The critical temperature, Tc, was defined as described above from η*. The relationship is shown in Figure 2. Technologists can determine the value of η* by using the DSR and generally following ASTM D7175, “Standard Test Method for Determining the Complex Shear Modulus (G*) of Bituminous Mixtures Using Dynamic Shear Rheometer.” Testing should be conducted at a frequency of 1 rad/s using 25-mm parallel plate geometry and an applied shear strain of 5 percent. For coating asphalt binders, testing should be started at 90°C and the value of the complex viscosity (η*) determined. Testing is then continued to determine complex viscosity values at 100°C and 110°C. The technologist can then plot complex viscosity, η*, as a function of temperature on a semi-logarithmic graph. 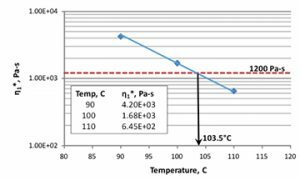 The temperature can then be determined, to the nearest 0.1°C, where η1* is equal to 1200 Pa-s. This temperature may be interpolated or extrapolated. An example is shown in Figure 3. • Rheologic testing of an asphalt coating binder can provide meaningful data which relates directly to the performance of a shingle. • Rheologic testing done through the Asphalt Institute and Paragon Technical Services has been able to develop relationships to the traditional tests of softening point and penetration. • With some more work through the member companies of the Asphalt Institute, an accepted rheologic testing protocol can be developed to fully characterize an asphalt coating binder. • Due to the proprietary nature of shingle manufacturing and products, and due to the different manufacturing practices, processes and raw materials each shingle manufacturer uses, the best outcome expected is a sound scientific testing protocol to characterize these asphalt coating binders. • Each manufacturer will then have this testing protocol to interpret or set their own specification limits around asphalt shingle coating from these testing protocols. Mike Franzen, Laurand Lewandowski, Mike Anderson and Gaylon Baumgardner collaborated on this article.